Game Information: Play ‘n Go is a fairly new online casino software provider, but are quickly making a name for themselves with interesting, well-designed and innovative pokies. Book of Dead, which was released in 2016, is a great example of this. Instead of the usual coin adjustment, bet size and active payline adjustment done on the same screen, users can switch over to a nifty control panel, complete with easy sliders to adjust and fine tune ever bet. The game features an exotic Ancient Egyptian theme and is built on a 5 x 3 layout and just 10 paylines. Each payline can be individually activated, as can the coin value and bet per active payline, making Book of Dead the perfect all-rounder for any pokies budget. 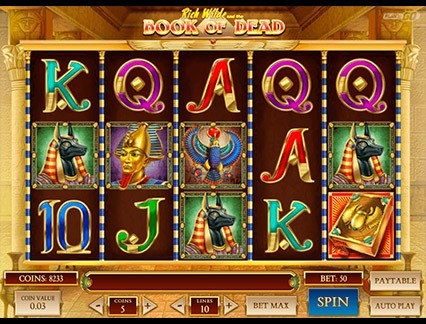 Playing Book of Dead couldn’t be easier and, after adjusting the betting options to suit your particular preferences, all you have to do is press the spin button. You can also set Book of Dead to spin automatically, giving you the chance to sit back and relax and watch the combos pile up. 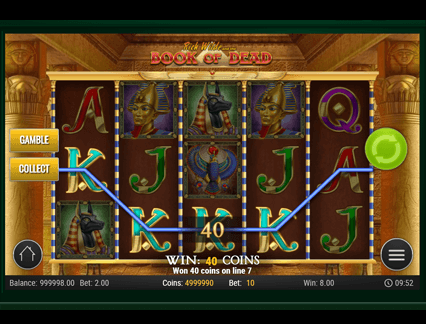 Book of Dead is quite a fast paced pokie and features a number of interesting and iconic symbols designed to make winning on every spin easier. 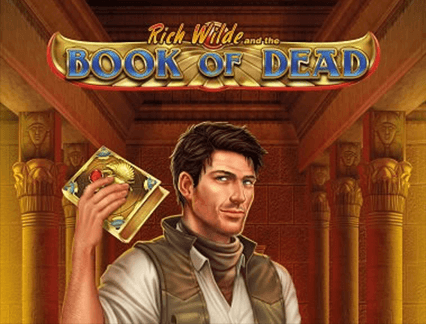 Interestingly, Book of Dead features a combined wild and scatter, setting it apart from how most other online pokies work. Usually you will have a separate wild symbol, which is used to substitute for other game symbols and make putting winning combinations together much easier. The scatter is usually used to trigger bonus games such as free spins or bonus rounds with multipliers. However, in Book of the Dead, these are combined into one unique symbol, making for a faster and more exciting game. The Wild/Scatter Symbol: Getting three or more Book of Ra symbols will activate the Free Spins bonus round, giving you a shot at the highest paying stage of the game. You start off the free spins bonus round with 10 free spins and, before the free spins begin, a special expanding scatter symbol is selected which could be the Anubis symbol or any of the other special game symbols. The expanding scatter symbol will fill the reel that it lands on and will pay out on all ten paylines. The more of these scatter symbols that you land, the bigger your payouts will be. The free spins bonus round can be re-triggered with no limits on how many times it can be re-triggered so, on a good game you stand to make substantial wins. Other Symbols: Scatter wins are multiplied by the total bet stake and added to your winning total. Getting 5 scatters in a row adds 200, four adds 20 and three adds 2. Rich Wilde is a central character in the game and getting five of him in a row will give you a win of 5000 coins. Other key symbols to look out for include the god Ra which pays 2000 coins for five in a row, Anubis pays 750 coins for five in a row. While many will inevitably compare Book of Dead to Novomatic’s Book of Ra, there are quite a few differences. For one thing, Book of Dead features superior graphics and sound. The artwork alone makes this pokie stand out and cool symbols including Anubis, Rich Wilde (an Indiana Jones type character), Osiris, the Book of Dead, and other iconic symbols from Ancient Egypt are all beautifully rendered. The sound is also exceptional and adds a lot to the atmosphere of the game. There is a constant soundtrack of Egyptian music playing in the background and, as soon as Book of the Dead wilds/scatters begin to appear on the reels a dramatic sound starts to build up, giving players a real sense of anticipation. The Book of Dead does not feature any sort of progressive jackpot although it does come with a fairly big fixed jackpot of 250,000 coins. However, it is important to note that this pokie is a high variance pokie, so in order to hunt the jackpot you will need patience and a good bankroll. Perhaps the most interesting feature of Book of Dead is the combined scatter and wild symbol, making the game somewhat faster than most other pokies. Triggering and re-triggering free spins rounds complete with random expanding scatters also helps to make the game interesting and certainly worth playing.